[OFFICIAL CONTEST] - 5th Anniversary! As you might have heard, TECREAT (Tanktastic English Community REcreational and promotionAl Team) is being continued after a period with some internal matters. That means that you, the Tanktastic English Community, will now have a full team available to organize contests for the English Community only. And so, it was decided that TECREAT may host up to two (2) contests a month with prizes included. But let’s not talk about that too much at this very moment, as more information and details will be announced in due time. 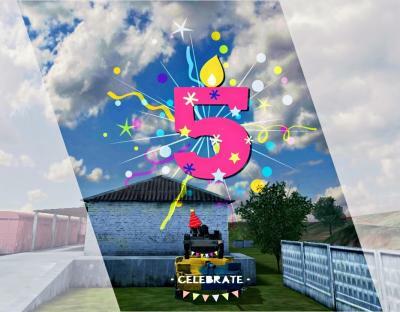 This September, a special event took place which is, of course, the 5th Anniversary of Tanktastic. Although we already celebrated this event with a contest hosted by Denis.tw, we would like to celebrate this special year a little more! This is only a one-time event. Therefore, TECREAT decided to give this contest the touch of this special event: the 5th anniversary. The concept of the contest is like the Christmas Truce contest, held during Christmas in 2016. Fellow tankers; friends; those that were with you the last five (5) years, those with who you have been sharing stories, fun, laughs and more, show your bond that you established with your fellow tank commanders during those years. We ask you to provide us with the best examples of the remarkable camaraderie you have with the ones you have been sharing unforgettable moments and friendship with. Show us the fun you had with those people in the past five (5) years of Tanktastic, whether it is a screenshot or video. Show us the camaraderie you have built, show us the bond of you and your fellow tank commanders. Simply put, you have to provide us with the finest example of how you and your fellow tankers of this Tanktastic family celebrated this special event, the 5th anniversary of Tanktastic. 1st place: One week of premium account. 2nd place: 100 gold credits. 3rd place: A camouflage. The winner may choose a camouflage of his/her own choice and select the tank on which the camouflage should be added. ● Content; how much content is related to the theme, the 5th anniversary. ● Difficulty; of what level is the entry. ● **In case an entry has been edited, it will be kept in mind when judging. If you have any questions about the concept, the prizes or the judgement, please contact any willing member of TECREAT through a Private Message (PM)! Your submissions will have to be in the form of a screenshot or video. Please keep in mind that the difference will be kept in mind during the judgment. All submissions must comply with the current Forum rules and End User License Agreement (EULA). Submissions that don't comply with said rules will be disqualified immediately. Entries may be given a title, although this is not necessary, you can get extra points for doing so. You are allowed to edit your screenshot or video the way you prefer, as long they do comply with the current Forum Rules and EULA. It is not allowed to submit more than one entry for the contest. If a user is found doing this, he/she will be asked to delete all entries aside the one he/she wants to participate with. Players are allowed to create their submission with other players, thus a group, but bear in mind that only the group/project leader will be awarded with a price if his/her entry was selected for a prize. Any content posted in the Submission topic that is not related to the contest will be removed on behalf of TECMAT/TECMOT. All those taking part to the contest will be allowed to submit their entry in a Submission Topic that will be open from the 29th of September 2017, 20:00 CET until the 30th of September 2017, 22:00 CET. All submissions will be reviewed in the following day, the 1st of October and the winning players will be published in a separate topic the same day. Prizes will be awarded to all winners as soon as possible after publishing the winning players. If you have any questions about the concept, the prizes or the judgement, contest guidelines or anything else regarding this contest , please contact any willing member of TECREAT through a Private Message (PM)! Thank you all for being the amazing Community the last five (5) years and of course in the future as well and best regards from all of us! *To start with, the contests and the prizes will be rather small. After a period of time with the activity and participations taken into account, we will consider more large contests and prizes. In the case of a large amount of participations, we will consider to increase the number of prizes. To be clear, it is not necessary to edit your picture, video. As said under the 4th point of the contest guidelines, you are allowed to do so, but that also means that you do not need to edit said media. Community staff can participate too ? I'm looking forward to all the great submissions we will be getting. The Christmas contest was the only contest that required effort to participate I was around for but due to my lack of content I could never participate. I am very happy to give my feedback though. Time for another YouTube video eh?